The debates over mobile spectrum aggregation and the auction rules for the FCC’s upcoming incentive auction — like all regulatory rent-seeking — can be farcical. One aspect of the debate in particular is worth highlighting, as it puts into stark relief the tendentiousness of self-interested companies making claims about the public interestedness of their preferred policies: The debate over how and whether to limit the buying and aggregating of lower frequency (in this case 600 MHz) spectrum. A little technical background is in order. At its most basic, a signal carried in higher frequency spectrum doesn’t travel as well as a signal carried in lower frequency spectrum. The higher the frequency, the closer together cell towers need to be to maintain a good signal. 600MHz is relatively low frequency for wireless communications. In rural areas it is helpful in reducing infrastructure costs for wide area coverage because cell towers can be placed further apart and thus fewer towers must be built. But in cities, population density trumps frequency, and propagation range is essentially irrelevant for infrastructure costs. In other words, it doesn’t matter how far your signal will travel if congestion alleviation demands you build cell towers closer together than even the highest frequency spectrum requires anyway. The optimal — nay, the largest usable — cell radius in urban and suburban areas is considerably smaller than the sort of cell radius that low frequency spectrum allows for. It is important to note, of course, that signal distance isn’t the only propagation characteristic imparting value to lower frequency spectrum; in particular, it is also valuable even in densely populated settings for its ability to travel through building walls. That said, however, the primary arguments made in favor of spreading the 600 MHz wealth — of effectively subsidizing its purchase by smaller carriers — are rooted in its value in offering more efficient coverage in less-populated areas. Thus the FCC has noted that while there may be significant infrastructure cost savings associated with deploying lower frequency networks in rural areas, this lower frequency spectrum provides little cost advantage in urban or suburban areas (even though, as noted, it has building-penetrating value there). It is primarily because of these possible rural network cost advantages that certain entities (the Department of Justice, Free Press, the Competitive Carriers Association, e.g.) have proposed that AT&T and Verizon (both of whom have significant lower frequency spectrum holdings) should be restricted from winning “too much” spectrum in the FCC’s upcoming 600 MHz incentive auctions. 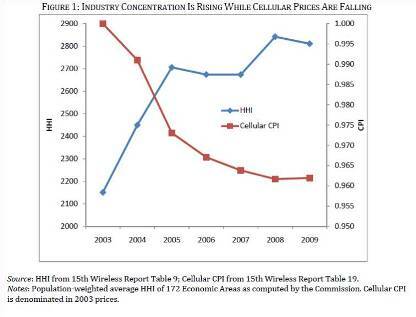 The argument goes that, in order to ensure national competition — that is, to give other companies financial incentive to build out their networks into rural areas — the auction should be structured to favor Sprint and T-Mobile (both of whose spectrum holdings are mostly in the upper frequency bands) as awardees of this low-frequency spectrum, at commensurately lower cost. Shockingly, T-Mobile and Sprint are on board with this plan. So, to recap: 600MHz spectrum confers cost savings when used in rural areas. It has much less effect on infrastructure costs in urban and suburban areas. T-Mobile and Sprint don’t have much of it; AT&T and Verizon have lots. If we want T-Mobile and Sprint to create the competing national networks that the government seems dead set on engineering, we need to put a thumb on the scale in the 600MHz auctions. So they can compete in rural areas. Because that’s where 600MHz spectrum offers cost advantages. In rural areas. So what does T-Mobile plan to do if it wins the spectrum lottery? Certainly not build in rural areas. As Craig Moffett notes, currently “T-Mobile’s U.S. network is fast…but coverage is not its strong suit, particularly outside of metro areas.” And for the future? T-mobile’s breakneck LTE coverage ramp up since the failed merger with AT&T is expected to top out at 225 million people, or the 71% of consumers living in the most-populated areas (it’s currently somewhere over 200 million). “Although sticking to a smaller network, T-Mobile plans to keep increasing the depth of its LTE coverage” (emphasis added). Depth. That means more bandwidth in high-density areas. It does not mean broader coverage. Obviously. Sprint, meanwhile, is devoting all of its resources to playing LTE catch-up in the most-populated areas; it isn’t going to waste valuable spectrum resources on expanded rural build out anytime soon. The kicker is that T-Mobile relies on AT&T’s network to provide its urban and suburban customers with coverage (3G) when they do roam into rural areas, taking advantage of a merger break-up provision that gives it roaming access to AT&T’s 3G network. In other words, T-Mobile’s national network is truly “national” only insofar as it piggybacks on AT&T’s broader coverage. And because AT&T will get the blame for congestion when T-Mobile’s customers roam onto its network, the cost to T-Mobile of hamstringing AT&T’s network is low. The upshot is that T-Mobile seems not to need, nor does it intend to deploy, lower frequency spectrum to build out its network in less-populated areas. Defenders say that rigging the auction rules to benefit T-Mobile and Sprint will allow them to build out in rural areas to compete with AT&T’s and Verizon’s broader networks. But this is a red herring. They may get the spectrum, but they won’t use it to extend their coverage in rural areas; they’ll use it to add “depth” to their overloaded urban and suburban networks. But for AT&T the need for additional spectrum is made more acute by the roaming deal, which requires it to serve its own customers and those of T-Mobile. This makes clear the reason underlying T‑Mobile’s advocacy for rigging the 600 MHz auction – it is simply so that T‑Mobile can acquire this spectrum on the cheap to use in urban and suburban areas, not so that it can deploy a wide rural network. And the beauty of it is that by hamstringing AT&T’s ability to acquire this spectrum, it becomes more expensive for AT&T to serve T‑Mobile’s own customers! Two birds, one stone: lower your costs, raise your competitor’s costs. The lesson is this: If we want 600 MHz spectrum to be used efficiently to provide rural LTE service, we should assume that the highest bidder will make the most valuable use of the spectrum. The experience of the relatively unrestricted 700 MHz auction in 2008 confirms this. The purchase of 700 MHz spectrum by AT&T and Verizon led to the US becoming the world leader in LTE. Why mess with success? Like most libertarians I’m concerned about government abuse of power. Certainly the secrecy and seeming reach of the NSA’s information gathering programs is worrying. But we can’t and shouldn’t pretend like there are no countervailing concerns (as Gordon Crovitz points out). And we certainly shouldn’t allow the fervent ire of the most radical voices — those who view the issue solely from one side — to impel technology companies to take matters into their own hands. At least not yet. Rather, the issue is inherently political. And while the political process is far from perfect, I’m almost as uncomfortable with the radical voices calling for corporations to “do something,” without evincing any nuanced understanding of the issues involved. Frankly, I see this as of a piece with much of the privacy debate that points the finger at corporations for collecting data (and ignores the value of their collection of data) while identifying government use of the data they collect as the actual problem. Typically most of my cyber-libertarian friends are with me on this: If the problem is the government’s use of data, then attack that problem; don’t hamstring corporations and the benefits they confer on consumers for the sake of a problem that is not of their making and without regard to the enormous costs such a solution imposes. Stratton said that as a company, Verizon follows the law, and those laws are set by governments. I completely agree. There may be a problem, but before we deputize corporations in the service of even well-meaning activism, shouldn’t we address this as the political issue it is first? I find it interesting that the “blame” for privacy incursions by the government is being laid at Google’s feet. Google isn’t doing the . . . incursioning, and we wouldn’t have to saddle Google with any costs of protection (perhaps even lessening functionality) if we just nipped the problem in the bud. Importantly, the implication here is that government should not have access to the information in question–a decision that sounds inherently political to me. I’m just a little surprised to hear anyone (other than me) saying that corporations should take it upon themselves to “fix” government policy by, in effect, destroying records. But at the same time, it makes some sense to look to Google to ameliorate these costs. Google is, after all, responsive to market forces, and (once in a while) I’m sure markets respond to consumer preferences more quickly and effectively than politicians do. And if Google perceives that offering more protection for its customers can be more cheaply done by restraining the government than by curtailing its own practices, then Dan [Solove]’s suggestion that Google take the lead in lobbying for greater legislative protections of personal information may come to pass. Of course we’re still left with the problem of Google and not the politicians bearing the cost of their folly (if it is folly). As I said then, there may be a role for tech companies to take the lead in lobbying for changes. And perhaps that’s what’s happening. But the impetus behind it — the implicit threats from civil liberties groups, the position that there can be no countervailing benefits from the government’s use of this data, the consistent view that corporations should be forced to deal with these political problems, and the predictable capitulation (and subsequent grandstanding, as Stratton calls it) by these companies is not the right way to go. I applaud Verizon’s stance here. Perhaps as a society we should come out against some or all of the NSA’s programs. But ideological moralizing and corporate bludgeoning aren’t the way to get there. Today’s oral argument in the D.C Circuit over the FCC’s Net Neutrality rules suggests that the case — Verizon v. FCC — is likely to turn on whether the Order impermissibly imposes common carrier regulation on broadband ISPs. If so, the FCC will lose, no matter what the court thinks of the Commission’s sharply contested claims of authority under the Telecommunications Act. The FCC won last year before the same court when Verizon challenged its order mandating that carriers provide data roaming services to their competitors’ customers. But Judge Tatel, who wrote the Cellco decision is likely to write the court’s opinion overturning the Net neutrality rules — just as he wrote the court’s 2010 Comcast v. FCC opinion, thwarting the FCC’s first attempt at informal net neutrality regulation. Over an extraordinary two-hour session, Judges Tatel and Silberman asked a barrage of questions that suggest they’ll apply the same test used to uphold the data roaming rule to strike down at least the non-discrimination rule at the heart of the Open Internet Order — and probably, the entire Order. The Communications Act explicitly prohibits treating services that are not regulated under Title II as common carriers. Title II regulates “telecommunications services,” such as landline telephone service, but broadband is an “information service” regulated under Title I of the Act, while wireless is regulated under Title III of the Act (as a “radio transmission”). In Cellco, the court ruled that the FCC’s data roaming rule did not impermissibly classify mobile providers as common carriers even though it compelled wireless carriers to let other companies’ subscribers roam on their networks. Here, the Open Internet Order effectively forces ISPs to carry traffic of all “edge” providers in an equal, non-discriminatory manner. While these might seem similar, the two mandates differ significantly, and Tatel’s analysis in the data roaming case may lead to precisely the opposite result here. In this gray area, “[the FCC’s] determination that a regulation does or does not confer common carrier status warrants deference” under the Supreme Court’s Chevron decision. The Open Internet rules, by contrast, impose a much harsher restriction on what ISPs may do with their broadband networks, barring them from blocking any legal content and prohibiting “unreasonable” discrimination. Judges Tatel and Silberman repeatedly asked questions that suggested that the Order’s reasonable discrimination rule removed the kind of “flexibility” that justified upholding the data roaming rule. By requiring carriers to “offer service indiscriminately and on general terms” and to “hold out facilities indifferently for public use” (to quote the D.C. Circuit’s test), the rule would go beyond the “gray area” in which the FCC gets deference, and fall into the D.C. Circuit’s definition of common carriage. If that’s indeed ultimately where the two judges wind up, it’s game over for the FCC. The Open Internet Order requires broadband ISPs to make their networks available, and to do so on equal terms that remove pricing flexibility, to any edge provider that wishes to have its content available on an ISP’s network. This seems to be Judge Tatel’s interpretation of ¶ 76 of the Order, which goes on at length about the reasons why “pay for priority” arrangements would “raise significant cause for concern” and then concludes: “In light of each of these concerns, as a general matter, it’s unlikely that pay for priority would satisfy the ‘no unreasonable discrimination’ standard.” So… legal in principle, but effectively banned in practice — a per se rule dressed up as a rule of reason. If that isn’t, in effect, a requirement that ISPs hold out their networks “indifferently for public use,” it’s hard to imagine what is — as Tatel certainly seemed to think today. Tatel’s use of the term “indiscriminately” in Cellco almost hints that the test was written with the FCC’s “no discrimination” rule in mind. The FCC tried, but failed, to address such concerns in the Open Internet Order, by arguing that broadband providers remained free to “make individualized decisions” with the only customers that matter: their subscribers. Today, the agency again insisted that restricting, however heavily, a broadband provider’s ability to negotiate with an edge provider (or the backbone providers in between) is irrelevant to the analysis of whether the FCC has illegally imposed common carriage. But if that argument worked, the D.C. Circuit would not have had to analyze whether the data roaming rule afforded sufficient flexibility to carriers in contracting with other carriers to provide data roaming services to their customers. Perhaps the most damning moment of today’s arguments occurred when Verizon’s lawyer responded to questions about what room for negotiation was left under the unreasonable discrimination rule — by pointing to what the FCC itself said in Footnote 240 of the Order. There the FCC quotes, approvingly, comments filed by Sprint: “The unreasonable discrimination standard contained in Section 202(a) of the Act contains the very flexibility the Commission needs to distinguish desirable from improper discrimination.” In other words, the only room for “commercially reasonable negotiation” recognized by the FCC under the nondiscrimination rule is found in the limited discretion traditionally available to common carriers under Section 202(a). Oops. This #LawyerFail will doubtless feature prominently in the court’s discussion of this issue, as the FCC’s perhaps accidental concession that, whatever the agency claims, it’s really imposing common carrier status — analogous to Title II, no less! Judges Tatel and Silberman seemed to disagree only as to whether the no-blocking rule would also fail under Cellco’s reasoning. Tatel suggested that if the non-discrimination rule didn’t exist, the blocking rule, standing alone, would “leave substantial room for individualized bargaining and discrimination in terms” just as the data roaming rule did. Tatel spent perhaps fifteen minutes trying to draw clear answers from all counsel on this point, but seemed convinced that, at most, the no-blocking rule simply imposed a duty on the broadband provider to allow an edge provider to reach its customers, while still allowing the broadband provider to negotiate for faster carriage on “commercially reasonable terms.” Silberman disagreed, insisting that the blocking rule still imposed a common carrier duty to carry traffic at a zero price. Ultimately the distinction between these two rules under Cellco’s common carriage test may not matter. If the court decides that the order is not severable, striking down the nondiscrimination rule as common carriage would cause the entire Order to fall. The question, as the Supreme Court held in K Mart Corp. v. Cartier, Inc., is whether the remainder of the regulation could function sensibly without the stricken provision. This isn’t clear. While Judge Tatel seems to suggest that the rule against blocking could function without the nondiscrimination rule, Judge Silberman seems convinced that the two were intended as necessary complements by the FCC. The determination of the no-blocking rule’s severability may come down to Judge Rogers, who didn’t telegraph her view. The prediction made by Fred Campbell shortly after the Cellco decision seems like the most likely outcome: Tatel, joined by at least Silberman, could strike down the entire Order as imposing common carriage — while offering the FCC a roadmap to try its hand at Net Neutrality yet again by rewriting the discrimination rule to allow for prioritized or accelerated carriage on commercially reasonable terms. Or, if the the court decides the order is severable, it could strike down just the nondiscrimination rule — assuming the court could find either direct or ancillary jurisdiction for both the transparency rule and the non-discrimination rule. Either way, an FCC loss will mean that negotiated arrangements for priority carriage will be governed under something more like a rule of reason. The FCC could try to create its own rule. Or the matter could simply be left to the antitrust and consumer protection laws enforced by the Department of Justice, the Federal Trade Commission, the states and private plaintiffs. We think the latter’s definitely the best approach. But whether it is or not, it will be the controlling legal authority on the ground the day the FCC loses — unless and until the FCC issues revised rules (or Congress passes a law) that can survive judicial review. Ultimately, we suspect the FCC will have a hard time letting go. After 79 years, it’s clearly in denial about its growing obsolescence. At today’s Open Commission Meeting, the FCC is set to consider two apparently forthcoming Notices of Proposed Rulemaking that will shape the mobile broadband sector for years to come. It’s not hyperbole to say that the FCC’s approach to the two issues at hand — the design of spectrum auctions and the definition of the FCC’s spectrum screen — can make or break wireless broadband in this country. The FCC stands at a crossroads with respect to its role in this future, and it’s not clear that it will choose wisely. Chairman Genachowski has recently jumped on the “psychology of abundance” bandwagon, suggesting that the firms that provide broadband service must (be forced by the FCC to) act as if spectrum and bandwidth were abundant (they aren’t), and not to engage in activities that are sensible responses to broadband scarcity. According to Genachowski, “Anything that depresses broadband usage is something that we need to be really concerned about. . . . We should all be concerned with anything that is incompatible with the psychology of abundance.” This is the idea — popularized by non-economists and ideologues like Susan Crawford — that we should require networks to act as if we have “abundant” capacity, and enact regulations and restraints that prevent network operators from responding to actual scarcity with business structures, rational pricing or usage rules that could in any way deviate from this imaginary Nirvana. This is rhetorical bunk. The culprit here, if there is one, isn’t the firms that plow billions into expanding scarce capacity to meet abundant demand and struggle to manage their networks to maximize capacity within these constraints (dubbed “investment heroes” by the more reasonable lefties at the Progressive Policy Institute). Firms act like there is scarcity because there is — and the FCC is largely to blame. What we should be concerned about is not the psychology of abundance, but rather the sources of actual scarcity. The FCC faces a stark choice—starting with tomorrow’s meeting. The Commission can choose to continue to be the agency that micromanages scarcity as an activist intervenor in the market — screening-out some market participants as “too big,” and scrutinizing every scarcity-induced merger, deal, spectrum transfer, usage cap, pricing decision and content restriction for how much it deviates from a fanciful ideal. Or it can position itself as the creator of true abundance and simply open the spectrum spigot that it has negligently blocked for years, delivering more bandwidth into the hands of everyone who wants it. If the FCC chooses the latter course — if it designs effective auctions that attract sellers, permitting participation by all willing buyers — everyone benefits. Firms won’t act like there is scarcity if there is no scarcity. Investment in networks and the technology that maximizes their capacity will continue as long as those investments are secure and firms are allowed to realize a return — not lambasted every time they try to do so. If, instead, the Commission remains in thrall to self-proclaimed consumer advocates (in truth, regulatory activists) who believe against all evidence that they can and should design industry’s structure (“big is bad!”) and second-guess every business decision (“psychology of abundance!”), everyone loses (except the activists, I suppose). Firms won’t stop acting like there’s scarcity until there is no scarcity. And investment will take a backseat to unpopular network management decisions that represent the only sensible responses to uncertain, over-regulated market conditions. “Real lawyers read the footnotes!”—thus did Harold Feld chastise Geoff and Berin in a recent blog post about our CNET piece on the Verizon/SpectrumCo transaction. We argued, as did Commissioner Pai in his concurrence, that the FCC provided no legal basis for its claims of authority to review the Commercial Agreements that accompanied Verizon’s purchase of spectrum licenses—and that these agreements for joint marketing, etc. were properly subject only to DOJ review (under antitrust). Harold insists that the FCC provided “actual analysis of its authority” in footnote 349 of its Order. But real lawyers read the footnotes carefully. That footnote doesn’t provide any legal basis for the FTC to review agreements beyond a license transfer; indeed, the footnote doesn’t even assert such authority. In short, we didn’t cite the footnote because it is irrelevant, not because we forgot to read it. The FCC’s review of the Commercial Agreements accompanying the spectrum deal exceeded the limits of Section 310(d) of the Communications Act. As Commissioner Pai noted in his concurring statement, “Congress limited the scope of our review to the proposed transfer of spectrum licenses, not to other business agreements that may involve the same parties.” We (and others) raised this concern in public comments filed with the Commission. Here’s the agency’s own legal analysis — in full: “The Commission has authority to review the Commercial Agreements and to impose conditions to protect the public interest.” There’s not even an accompanying footnote. Even if Harold were correct that footnote 349 provides citations to possible sources of authority for the FCC to review the Commercial Agreements, it remains irrelevant to our claim: The FCC exceeded its authority under 310(d) and asserted its authority under 310(d) without any analysis or citation. Footnote 349 begins with the phrase, “[a]side from Section 310(d)….” It is no surprise, then, that the footnote contains no analysis of the agency’s authority under that section. The FCC’s authority under 310(d) is precisely what is at issue here. The question was raised and argued in several submissions to the Commission (including ours), and the Commission is clearly aware of this. In paragraph 142 of the Order, the agency notes the parties’ objection to its review of the Agreements: “Verizon Wireless and the Cable Companies respond that the Commission should not review the Commercial Agreements because… the Commission does not have authority to review the agreements.” That objection, rooted in 310(d), is to the Commission extending its transaction review authority (unquestionably arising under only 310(d)) beyond that section’s limits. The Commission then answers the parties’ claim in the next paragraph with the language we quoted: “The Commission has authority to review the Commercial Agreements and to impose conditions to protect the public interest.” By doing so without reference to other statutory language, it seems clear that the FCC’s unequivocal, unsupported statement of authority is a statement of authority under 310(d). This is as it should be. The FCC’s transaction review authority is limited to Section 310(d). Thus if the agency were going to review the Commercial Agreements as part of the transfer, the authority to do so must come from 310(d) alone. But 310(d) on its face provides no authority to review anything beyond the transfer of spectrum. If the Commission wanted to review the Commercial Agreements, it needed to provide analysis on how exactly 310(d), despite appearances, gives it the authority to do so. But the Commission does nothing of the sort. But let’s be charitable, and consider whether footnote 349 provides relevant analysis of its authority to review the Commercial Agreements under any statute. The Commission did cite to several other sections of the Communications Act in the paragraph (145) that includes footnote 349. But that paragraph relates not to the review of the transaction itself (or even the ability of the parties to enter into the Commercial Agreements) but to the Commission’s authority to ensure that Verizon complies with the conditions imposed on the transaction, and to monitor the possible effects the Agreements have on the market after the fact. Three of the four statutes cited in the footnote (47 U.S.C. §§ 152, 316, & 548) don’t appear to give the Commission authority for anything related this transaction. Only 47 U.S.C. § 201 is relevant. But having authority to monitor a wireless provider’s post-transaction business practices is far different from having the authority to halt or condition the transaction itself before its completion because of concerns about ancillary agreements. The FCC cites no statutes to support this authority—because none exist. This is not simply a semantic distinction. By claiming authority to review ancillary agreements in the course of reviewing license transfers, the Commission gains further leverage over companies seeking license transfer approvals, putting more of the companies’ economic interests at risk. This means companies will more likely make the “voluntary” concessions (with no opportunity for judicial scrutiny) that they would not otherwise have made—or they might not enter into deals in the first place. As we (Geoff and Berin) said in our CNET article, “the FCC has laid down its marker, letting all future comers know that its bargaining advantage extends well beyond the stack of chips Congress put in front of it.” In merger reviews, the house has a huge advantage, and it is magnified if the agency can expand the scope of activity under its review. Regardless, if the FCC were actually trying to rely on these other sections of the Communications Act for authority to review the Commercial Agreements, it would have cited them in Paragraph 143, where it asserted that authority—not two paragraphs later in a footnote supporting the agency’s order assigning post-transaction monitoring tasks to the Wireline Competition Bureau. Moreover, none of these alleged assertions of authority amounts to an analysis of the FCC’s jurisdiction. Given the debate that took place in the record over the issue, a simple list of statutes purporting to confer jurisdiction would be utterly insufficient in response. Not as insufficient as an unadorned, conclusory statement of authority without even such a list of statutes (what the FCC actually did) — but awfully close. We stand by our claim that the Commission failed to cite — let alone analyze — its authority to review the Commercial Agreements in this transaction. The FCC’s role in transaction reviews has been hotly contested, at least partially inspiring the FCC Process Reform Act that passed this spring in the House. Given the controversy around the issue, the Commission should have gone out of its way to justify its assertion of authority, citing precedent and making a coherent argument — in other words, engaging in legal analysis. At least, that’s what “real lawyers” would do. But in real politik, perhaps it was naïve of us to expect more analysis from the agency that tried to justify net neutrality regulation by pointing to a deregulatory statute aimed at encouraging the deployment of broadband and claiming that somewhere in there, perhaps, hidden between the lines, was the authority the agency needed—but which Congress never actually gave it. When the FCC plays fast and loose with the law in issuing regulations, someone will likely sue, thus forcing the FCC to justify itself to a court. On net neutrality, the D.C. Circuit seems all but certain to strike down the FCC’s Open Internet Order for lacking any firm legal basis. But when the FCC skirts legal limits on its authority in merger review, the parties to a merger have every incentive to settle and keep their legal qualms to themselves; even when the FCC blocks a merger, the parties usually calculate that t isn’t worth suing or trying to make a point about principle. Thus, through merger review, the FCC gets away with regulation by stealth—footnotes about legal authority be damned. Groups like the Electronic Frontier Foundation rightly worry about the FCC’s expansive claims of authority as a “Trojan Horse,” even when they applaud the FCC’s ends. We know Harold doesn’t like this transaction, but why doesn’t he worry about where the FCC is taking us? The pending wireless spectrum deal between Verizon Wireless and a group of cable companies (the SpectrumCo deal, for short) continues to attract opprobrium from self-proclaimed consumer advocates and policy scolds. In the latest salvo, Public Knowledge’s Harold Feld (and other critics of the deal) aren’t happy that Verizon seems to be working to appease the regulators by selling off some of its spectrum in an effort to secure approval for its deal. Critics are surely correct that appeasement is what’s going on here—but why this merits their derision is unclear. For starters, whatever the objections to the “divestiture,” the net effect is that Verizon will hold less spectrum than it would under the original terms of the deal and its competitors will hold more. That this is precisely what Public Knowledge and other critics claim to want couldn’t be more clear—and thus neither is the hypocrisy of their criticism. Note that “divestiture” is Feld’s term, and I think it’s apt, although he uses it derisively. His derision seems to stem from his belief that it is a travesty that such a move could dare be undertaken by a party acting on its own instead of under direct diktat from the FCC (with Public Knowledge advising, of course). Such a view—that condemns the private transfer of spectrum into the very hands Public Knowledge would most like to see holding it for the sake of securing approval for a deal that simultaneously improves Verizon’s spectrum position because it is better for the public to suffer (by Public Knowledge’s own standard) than for Verizon to benefit—seems to betray the organization’s decidedly non-public-interested motives. But Feld amasses some more specific criticisms. Each falls flat. AT&T just has too many advantages to reasonably expect someone else to get the licenses. For starters, AT&T has deeper pockets and can get more financing on better terms. But even more importantly, AT&T has a network plan based on the Lower 700 MHz A &B Block licenses it acquired in auction 2008 (and from Qualcomm more recently). It has towers, contracts for handsets, and everything else that would let it plug in Verizon’s licenses. Other providers would need to incur these expenses over and above the cost of winning the auction in the first place. Allow me to summarize: AT&T will win the licenses because it can make the most efficient, effective and timely use of the spectrum. The horror! Feld has in one paragraph seemingly undermined his whole case. If approval of the deal turns on its effect on the public interest, stifling the deal in an explicit (and Quixotic) effort to ensure that the spectrum ends up in the hands of providers less capable of deploying it would seem manifestly to harm, not help, consumers. And don’t forget that, whatever his preferred vision of the world, the most immediate effect of stopping the SpectrumCo deal will be that all of the spectrum that would have been transferred to—and deployed by—Verizon in the deal will instead remain in the hands of the cable companies where it now sits idly, helping no one relieve the spectrum crunch. But let’s unpack the claims further. First, a few factual matters. AT&T holds no 700 MHz block A spectrum. It bought block B spectrum in the 2008 auction and acquired spectrum in blocks D and E from Qualcomm. Second, the claim that this spectrum is essentially worthless, especially to any carrier except AT&T, is betrayed by reality. First, despite the claimed interference problems from TV broadcasters for A block spectrum, carriers are in fact deploying on the A block and have obtained devices to facilitate doing so effectively. Meanwhile, Verizon had already announced in November of last year that it planned to transfer 12 MHz of A block spectrum in Chicago to Leap (note for those keeping score at home: Leap is notAT&T) in exchange for other spectrum around the country, and Cox recently announced that it is selling its own A and B block 700 MHz licenses (yes, eight B block licenses would go to AT&T, but four A block licenses would go to US Cellular). Pretty clearly these A and B block 700 MHz licenses have value, and not just to AT&T. Verizon takes a giant leap forward in its spectrum holding and overall spectrum efficiency, whereas the competitors improve only marginally in absolute terms. Yes, compared to their current level of spectrum constraint, it would improve the ability of competitors [to compete] . . . [b]ut in absolute terms . . . the difference is so marginal it is not helpful. Verizon has already said that they have no plans (assuming they get the AWS spectrum) to actually use the Lower MHz 700 A & B licenses, so selling those off does not reduce Verizon’s lead in the spectrum gap. So if we care about the spectrum gap, we need to take into account that this divestiture still does not alleviate the overall problem of spectrum concentration, even if it does improve spectrum efficiency. Moreover, critics commit the same inappropriate fantasizing when criticizing the SpectrumCo deal itself. Again, even if Feld’s imaginary world would be preferable to the post-deal world (more on which below), that imaginary world simply isn’t on the table. What is on the table if the deal falls through is the status quo—that is, the world in which Verizon is stuck with spectrum it is willing to sell and foreclosed from access to spectrum it wants to buy; US Cellular, AT&T and other carriers are left without access to Verizon’s lower-block 700 MHz spectrum; and the cable companies are saddled with spectrum they won’t use. Perhaps, compared to this world, the deal does increase concentration. More importantly, compared to this world the deal increases spectrum deployment. Significantly. But never mind: The benefits of actual and immediate deployment of spectrum can never match up in the scolds’ minds to the speculative and theoretical harms from increased concentration, especially when judged against a hypothetical world that does not and will not ever exist. But what is most appalling about critics’ efforts to withhold valuable spectrum from consumers for the sake of avoiding increased concentration is the reality that increased concentration doesn’t actually cause any harm. In fact, it is simply inappropriate to assess the likely competitive effects of this or any other transaction in this industry by assessing concentration based on spectrum holdings. Of key importance here is the reality that spectrum alone—though essential to effective competitiveness—is not enough to amass customers, let alone confer market power. In this regard it is well worth noting that the very spectrum holdings at issue in the SpectrumCo deal, although significant in size, produce precisely zero market share for their current owners. Even the FCC recognizes the weakness of reliance upon market structure as an indicator of market competitiveness in its most recent Wireless Competition Report, where the agency notes that highly concentrated markets may nevertheless be intensely competitive. Although commonly trotted out as a conclusion in support of monopolization, the fact that a market may be concentrated is simply not a reliable indicator of anticompetitive effect, and naked reliance on such conclusions is inconsistent with modern understandings of markets and competition. As it happens, there is detailed evidence in the Fifteenth Wireless Competition Report on actual competitive dynamics; market share analysis is unlikely to provide any additional insight. And the available evidence suggests that the tide toward concentration has resulted in considerable benefits and certainly doesn’t warrant a presumption of harm in the absence of compelling evidence to the contrary specific to this license transfer. Instead, there is considerable evidence of rapidly falling prices, quality expansion, capital investment, and a host of other characteristics inconsistent with a monopoly assumption that might otherwise be erroneously inferred from a structural analysis like that employed by Feld and other critics. Feld and his friends can fret about the phantom problem of concentration all they like—it doesn’t change the reality that the real problem is the lack of available spectrum to meet consumer demand. It’s bad enough that they are doing whatever they can to stop the SpectrumCo deal itself which would ensure that spectrum moves from the cable companies, where it sits unused, to Verizon, where it would be speedily deployed. But when they contort themselves to criticize even the re-allocation of spectrum under the so-called divestiture, which would directly address the very issue they hold so dear, it is clear that these “protectors of consumer rights” are not really protecting consumers at all.